First Line: Cathbad and the cat look at each other. Dr. Ruth Galloway's friend Cathbad is housesitting in Walsingham, a medieval town known as England's Nazareth and famous for religious apparitions. When Cathbad sees a woman in a white dress and blue cloak in the cemetery one night, he believes he's had a vision of the Virgin Mary. But the vision turns into a dead body lying beside the road the very next day. Ruth's old friend Hillary is in town. Now an Anglican priest, Hillary has been receiving threatening letters, and knowing Ruth's association with the police, she asks for Ruth's advice but then is reluctant to follow it. When one of Hillary's fellow female priests is murdered before Walsingham's annual Good Friday Passion Play, Ruth, Cathbad and Detective Chief Inspector Harry Nelson find themselves teaming up to catch a killer. If you're new to this series and wondering if you should give it a try because you've heard people like me raving about it, let me give you one piece of advice: if you're a mystery reader who prefers the crime and its investigation over the characters, you might just want to give this series a miss. Now... it hurt me to say that because I'd love to have everyone read and love these books, but it's true. The characters in Elly Griffiths' Ruth Galloway series have personal lives that are every bit as rich as the mysteries they solve-- sometimes more so-- and their personal lives can often impinge on the investigation. In The Woman in Blue, we learn about another location in the county of Norfolk-- Walsingham-- and the place of women in the Church of England. It also gives us a chance to see Ruth side by side with a woman with whom she went to university. Ruth-- an archaeologist and single mother to five-year-old Kate, who is the result of one night of passion with the very married DCI Harry Nelson. What a contrast with Hillary, the Anglican priest! One of the strengths of this series is the relationship between Ruth and Nelson. This is no simple case of infidelity. Griffiths does an excellent job of showing the characters' good and bad points. It isn't a matter of readers blythely choosing which character they believe is hardest done by and cheering him or her on. As time passes, Nelson's wife is becoming a more important character, and no one can tell what the future will bring for any of them. I think Griffiths is superb at showing life in all its complexity. But how about the mystery, I hear you ask. It's a good one. There may not be much archaeology this time around, but there are several things going on, and one of the tasks readers have is to decide if everything connects to one source... or if there's more than one villain. It's certainly not an easy decision to make! 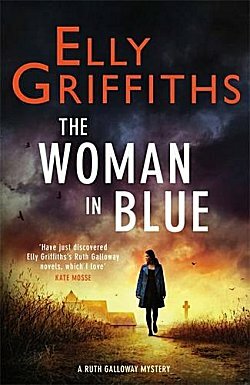 If you love mysteries with an excellent sense of place, complex and intriguing crimes to solve, and absolutely splendid characters, you'd be hard-pressed to find a series better than Elly Griffiths' Ruth Galloway. I love Ruth Galloway and this series, too, even when the murder mystery is just OK. But Ruth is a special character, one with many depths who does a lot of thinking about herself, her child, Harry Nelson, her friends and how to solve the murder mysteries. She's a regular person, no glamor or karate skills, no running in heels or going to the gym to be trim. She is someone many women readers can relate to. And that she solves crimes is a plus, too. She's interesting, her life is interesting and so are her friends. You've summed up her appeal very well, Kathy. I totally agree with you, I read this series because of the characters, not the mystery. It is a favorite of mine and I order the books from England because I can't wait for them to come out in the States. So you can tell that I get the UK editions, too (for the same reason)! I admit, Cathy, this is one of my top series. So I forgive it things that I wouldn't forgive in other series. Even so, aren't the characters fabulous?! Even better than fabulous, in my not-so-humble opinion! What other contemporary series has a druid in it? Not only that, he falls in love with a police officer. I think we all make a fine chorus, Kathy, for Elly's fabulous characters! I have a couple friends who keep reminding me to start this series. Great review, looking forward to getting on board! Oh, you won't regret it! Am on page 38 and am hooked, trying to find a way to squirm out of today's errands. And Harry Nelson is really involved in this book. Hopefully, those errands eluded you!